Please feel free to ask any questions. PayPal only, thanks! Set: 2011 Panini Gridiron Gear. Team: Indianapolis Colts. Manufacturer: Panini Group. Year: 2011. 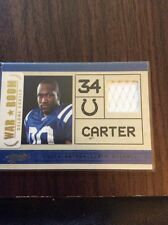 2011 Topps Precision RC Jumbo Relic Autographs #RAJRDC Delone Carter Auto Jersey. Shipped with USPS First Class Package. This card is in NM/MT condition and numbered 59/75. I AM BLOWING OUT A TON OF NICE SINGLES. 2011 PANINI THREADS NFL. BASE "R" PATCH AUTOGRAPH ROOKIE CARD. UP FOR SALE IS A... 2011 Certified #274 Delone Carter Autograph Quad Patch/Helmet/Ball Freshman Fabric Mirror Green RC 5/5 Of The Indianapolis Colts Please see scan for exact condition. Card has been stored in a penny sleeve and toploader and kept away from the light. Only taken out of protection to be pictured so you can see any imperfections when buying. Card will be shipped in a toploader and team bag packaged securely inside of a bubble mailer shipped via USPS. Delone played for the Indianapolis Colts. The card is number # 11 in the set. The serial number is # 274 of # 299. The event worn swatch is authenticated by Panini. Condition:The card is in near-mint to mint condition. 2011 DELONE CARTER PRESTIGE ROOKIE AUTO #45/599 SYRACUSE COLTS Free Shipping!! 2011 DELONE CARTER PRESTIGE ROOKIE AUTO #45/599 SYRACUSE COLTS Free Shipping!!. Condition is Brand New. Shipped with USPS First Class Package. 2011 Topps Chrome Football XFractor Complete Your Set! So don't be shy. So give us a chance to fix the problem before you report it. This great card features the Colts rookie, and is serial numbered 362 of 525. The card is in NM condition (colorful, crease free surface), and includes a certified autograph. 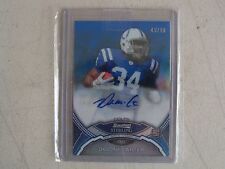 This great card features the Colts running back, and includes a certified autograph. The card is NM condition (colorful, crease free surface), is card a-5. YOU WILL RECEIVE THE ACTUAL CARD PICTURED IN THE SCAN. CARD HAS NO OBVIOUS FLAWS. WE PROVIDE AS CLEAR A SCAN AS POSSIBLE SO YOU CAN JUDGE THE CONDITION FOR YOURSELF. item description: 2011 rookie auto autograph, college !!. COMBINED SHIPPING AVAILABLE AT 75 CENTS PER EACH ADDITIONAL SINGLE CARD AFTER THE highest shipping item won WHEN PAID WITH ONE PAYMENT, PLEASE USE SHOPPING CART, YOUR SHIPPING OVERPAY WILL BE REFUNDED PROMPTLY OR PLEASE WAIT FOR INVOICE !! . SMALL LOTS SLIGHTLY HIGHER. payment due within 5 days of ebay winner notification message. thanks again for looking........& have a great day ! !.